When you think of car dealers and car salesmen, you usually do not have the best image in mind. I have been in the market for a car, and recently I had to deal with them. During one of my encounters, I worked with three different people at a certain dealership, which I will not name directly. What I will say is it is a Chevrolet dealer off Blackfoot Trail in SE Calgary, Alberta. If you really do not know, they rhyme with the word 'thaw', and start with the letter S. My time with them was quite a frustrating one, and while I ended up buying a car from them, I can honestly say they did not shake the image of an underhanded car salesman in my mind. Not only did they nickel and dime me from every side possible, while three times pressuring me to buy extended warranty, but at the end of the day, they did not honor the verbal agreements they said in the beginning. I will probably chalk this up to inexperience in dealing with these people, and the fact this could be a one-off issue. However, I think really what bugged me was the lack of honesty or consistency in their speech. They would practically do anything to get the sale, only to go back on the things they say. Their lack of integrity made me trust them less, and I will never go back to them, whether for service or for another purchase. However, consistency is not only important in your dealings with people, but also in electronics. Consistency, or what we call reliability, is quite important with components like power supplies. This is the heart of the computer, and there needs to be reliable performance to run the rest of your components safely and well. 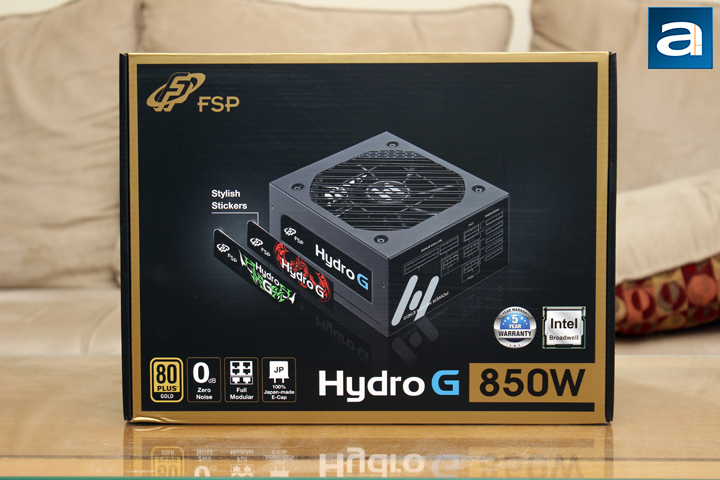 Today's FSP Hydro G 850W is up for inspection, and I have to wonder, is this another great PSU, or is this a lemon of a unit? Read on to find out! Today's unit of the FSP Hydro G arrived from FSP Group's USA offices in Chino, California. This is a pretty well-known city to us, as several manufacturers have locations in this area, including our friends at Cooler Master and SilverStone. 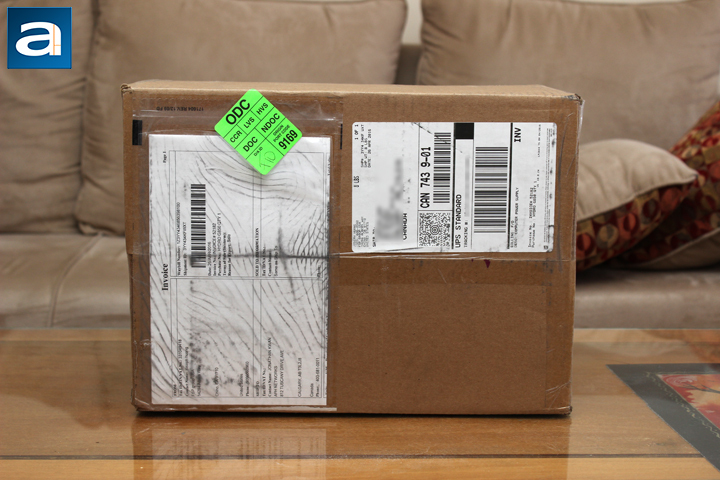 This parcel was delivered to us via UPS' Standard service, and it arrived in relatively good condition. As with most products coming to our APH Networks location here in Calgary, Alberta, the Hydro G 850W was originally delivered to the Editor-in-Chief's place, before he handed the products off to the other Calgary reviewers. However, this time around, Editor-in-Chief Jonathan Kwan was not present to actually receive the product, so I drove over and grabbed it from a secure location. The FSP Hydro G lineup was announced in May of 2015, but this is the first unit we have seen from FSP in quite a while. The last one we looked at, the FSP AURUM S 600W, was reported on by Kenneth Kwok. Before that was my first ever article for APH Networks, the Raider 550W. Much like the AURUM S, the Hydro G arrived in a relatively flat box. The front panel shows the Hydro G power supply unit in the middle with several features listed below, including the 80 Plus Gold certification, zero noise output, fully modular cables, and fully Japanese electrolytic capacitors. The FSP logo is printed in gold, while the panel is fully framed around. As you know, this is an 850W unit, but the Hydro G also comes in two other flavors of 650W and 750W power output. Inside the box, we have two notable parts inside. One is the power supply protected by two huge black foam brackets. The FSP Hydro G 850W is also in a plastic bag to prevent any surface scratches and stop any small particles from entering into the air holes. 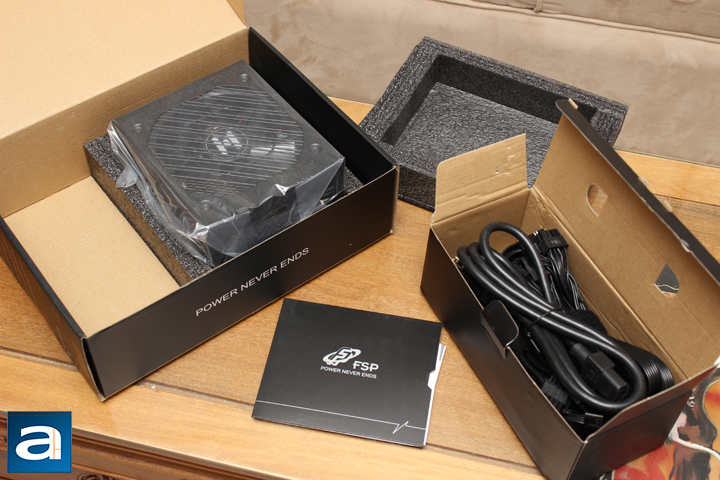 The other notable portion is a black cardboard box where all the cables are located. There are also four screws in a plastic bag to help in mounting. These cables are held together in a huge Velcro strap, rather than the standard twist tie. Finally, in the black envelope, there is a few things, including some documentation and stickers. These red and green stickers go over the sides of the Hydro G 850W to let the user better color coordinate their build. The extra decals are a one-time use, so just make sure you know what you want. Otherwise, there is some forgettable documentation, as the wording is perfect for everyone... as long as they are ant-sized. It almost would be better if FSP did not even include any sort of manual, because this is actually laughable.